The date on the portals shows "1900." A plan of repairs dated 1905-1914 reports the tunnel being completed in 1902. Notes on the drawing: "Begun 1899. Built by W. T. Manning. Subbed to Bennett & Talbot, 1901-2. Both ends 100 ft. from Portals should be grouted. Much ice accumulates at the ends in wintertime. Being repaired, grouted and voids above arch packed 1908 and 1909. Tangent 1630'. " A tangent is a straight section of track as compared to a radius or curved section. Markers at the northern portal indicate 17+33, suggesting 1,733 ft of length; this is does not seem to relate directly to the length of the tunnel. The tunnel was originally double-tracked; it now carries a single track. The Wheeling Division of the Baltimore and Ohio Railroad left the Pittsburgh-Cumberland mainline at Wheeling Junction, later reverting to its original name, Glenwood Junction. This single track line crosses the Monongahela River at Glenwood and follows the Streets Run valley southward, then heads southwest toward Wheeling. In 1928, the bridge traffic over the Monongahela River was reported as 19 freight trains and 12 passenger trains per day, carrying 7,333,580 tons and 219,000 passengers per year. The lines of the B&O railroad in Pittsburgh were originally built under the charter of other companies. The Pittsburgh and Connellsville Railroad was incorporated in 1837 and 1846, and the extension to Cumberland, MD, was completed in 1871. This is the CSX route along the right descending bank of the Monongahela River. The 2.1 mile long Glenwood Railroad was opened in 1897 between Wheeling Junction (Glenwood) and Marion Junction (near the western end of Hazelwood, before Laughlin Junction at Four Mile Run). The Wheeling, Pittsburgh and Baltimore Railroad was constructed over the 66.5 miles from Wheeling Junction (Glenwood) by way of Washington, PA, to Wheeling, WV. It was completed in stages between 1851 and 1883. The route includes this tunnel under PA51 in Baldwin. Before a bridge over the Monongahela River was completed, ferry service made the connection until 1884. Six Mile Ferry operated from the end of the W.B. Hays and Brothers Coal RR which served the many mining operations of J.H. Hays in the Streets Run and Glass Run valleys. A pair of tracks served many spurs into the mines before the B&O was laid into the valley. As the B&O acquired lines through Pittsburgh, it rebuilt many of the structures. On the Pittsburgh & Western line through Etna and Glenshaw, as well as this line south of Pittsbrugh to Wheeling, the companies which first constructed the railroad built tunnels which were upgraded when the B&O took over. 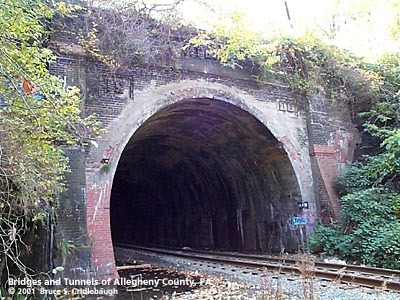 The Whitehall Tunnel on the Wheeling line was rebuilt in 1900 with design and construction details very similar to the tunnels at Etna and Glenshaw -- including the name "WHITEHALL" spelled out in the rough geometry of brick above the portals. The brick-lined walls of the Whitehall Tunnel differ one side to the other. The western wall is vertical below the spring line; the eastern wall varies, for the most part continuing the curve of the ceiling arch, but in some sections being slightly more vertical. There are many signs of alterations and repairs in various colors of brick and in concrete. Spaced along the length of both walls are safety bays used by railroad employees working inside the tunnel to escape an oncoming train. About 500 feet north of the tunnel, an old metal through truss bridge carries the now-closed route of the original road to Clairton. The wooden-decked bridge has been bypassed by Clairton Blvd (PA51) which crosses over the northern portal of the tunnel. To the south, the railroad emerges from the tunnel in a narrow valley leading toward Curry Hollow Rd (Miller's Grove) and Lick Run. The line along Lick Run is paralleled by the Wheeling and Lake Erie RR. That railroad has changed ownership through the years -- having been part of the West Side Belt RR of Jay Gould's Wabash system and later acquired by the Norfolk & Western. At Snowden in South Park Twp, the lines cross and diverge as the B&O turns southwestward into Washington County.